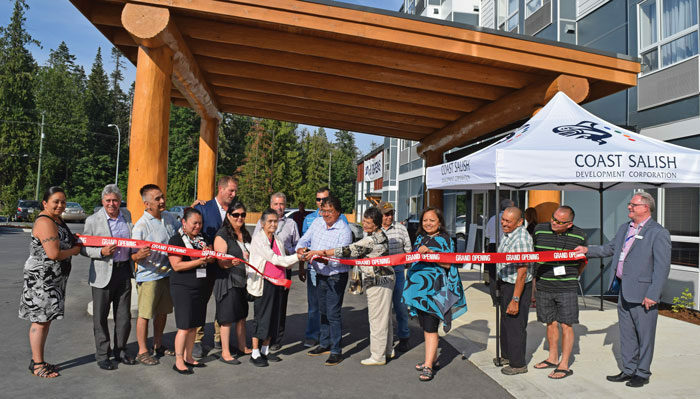 A few dozen people attended the event at the nation’s new Microtel Inn & Suites along the Trans-Canada Highway, which opened its doors in mid-May. During the celebration, guests were able to tour the facility before an official ribbon cutting ceremony took place. The growing Oyster Bay project has been operating for about a year and half now with offices, a gas station and a Tim Hortons. Chief John Elliott said Stz’uminus members have led the process, giving leaders the direction and drive to keep moving forward. Ladysmith Mayor Aaron Stone said the growing development is exciting for the local area. “Over the last few years we’ve seen just the tip of the iceberg of things that can happen in the greater community when people come together,” he said. Stz’uminus has 83 per cent ownership of the new Microtel in collaboration with MasterBUILT Hotels.